6 REPUBLICANS BRIBED BY HILLARY CLINTON? TO DESTROY TRUMP. I have no way of proving this Wikileaks exposure to be true. He is seldom if ever proven wrong. But, that being said, I can see it happening. Hillary right in the middle, everything filthy and she found scum bags to assist. This is just one of those off the wall (Off the Wall, great blog site title), out of nowhere thoughts that just occurred to me: Imagine Donald Trump as a newspaper/magazine editor. All the topics, all the stories, all things and those exposed….. Wikileaks before Wikileaks. Instead of a real estate magnet, a publishing icon? Imagine too, how often he’d be sued….more so than he has. What a great service….He has become an abbreviated editor with his Twitter I suppose. Imagine the editorials!? The debates…….Trump coverage, nothing would be out-of-bounds. 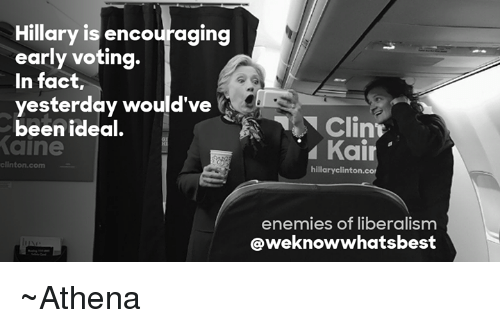 Hillary Clinton and her campaign are encouraging, out begging for voters to cast their ballots early. Why is it important for her to get them to vote early? Before they learn anymore from Wikileaks releases or the leaks from the investigations, that’s why. Shes losing votes by the day as we learn more about the corruption and treasonous crimes of Hillary and the Clinton Crime Syndicate.